Class-A analog circuitry makes it a preamp - great sound makes it a Fishman. Completely redesigned from the ground up, the all-analog Platinum Pro EQ universal instrument preamp delivers incredibly accurate sonic detail for any acoustic instrument. A discrete, high-headroom preamp combines with precision, high-speed circuitry for pure fidelity and low distortion. 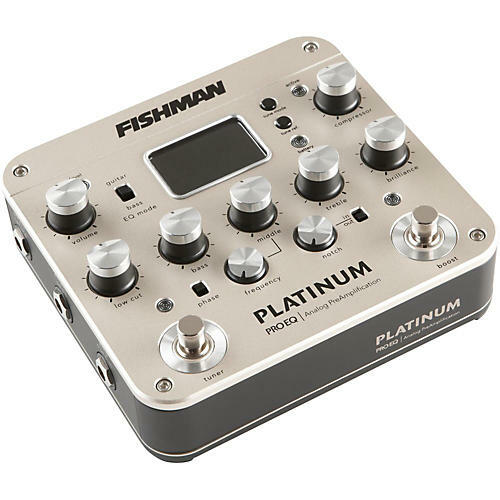 Classic Fishman tone controls are combined with a switchable guitar/bass EQ mode, making it more musical for use with bass instruments and more universal for recording and amplifying anything else. Critical performance features - including adjustable volume boost and balanced XLR D.I. outputs - are housed in a beautiful, road-ready design. The Platinum Pro EQ is built to be stomped on with durable foot switches that activate an adjustable volume boost or high-contrast chromatic tuner. It also includes a simple and effective analog soft-knee compressor, effect loop and precision sweepable notch filter.